Happy Monday and I hope you all had a fantastic weekend! It was a busy one for me started off with a visit to Heather's creative studio on Saturday morning, followed by brunch with friends at School, a cozy early evening visit to the Christmas Market, and a lot of cleaning to get my place ready for the holidays. I hope you are done with most of your shopping by now. However, if you still missing a few items on your checklist, today is your lucky day as my HomeSense special is back, and it is better than ever! 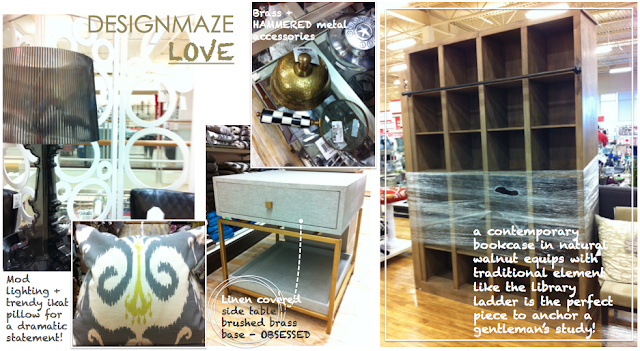 Have you ever wondered how to put the fabulous pieces you see at HomeSense together? With so many products in different styles and colorways, it is sometimes difficult to envision how the pieces would look in your own home. Starting this month, I will share with you rooms that inspire me and how you can achieve the look with my finds at HomeSense. My first inspiration is this bold and sophisticated nursery with stunning built-in, dynamite chevron pattern on the chair, and a killer vintage chandelier. My cousin recently added a baby boy to her family and so I have been on a look out for pieces that make a sumptuous nursery for those sleepless nights. 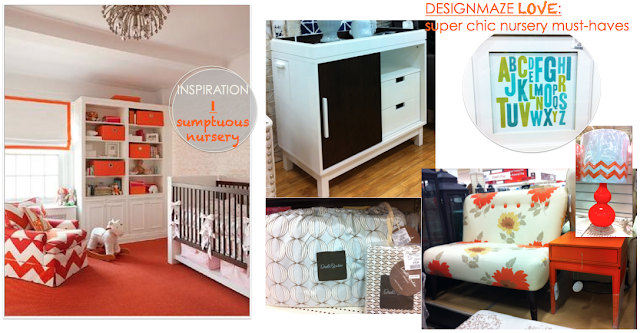 Aside from the obvious "Tangerine Tango" accent, the inspiration room also features a stylish crib in white + espresso. I didn't see a crib but check out this incredible contemporary change table + mega storage at unbeatable price. I also found some baby room essentials from Dwell Studio: I simply couldn't believe my own eyes when I saw them. Now for the orange accent, check out this beautiful settee upholstered in creamy fabric with bright orange blooms. LOVE!! The lacquered side table offers a pop of bold color and ties in to the traditional element in our inspiration room. To juxtapose against the floral settee and to provide a lighting source for late night reading, this adorable lamp with a chevron lamp shade is ideal for the space. For a final finishing touch, the chic alphabet print by Lindsay of The Penny Paper Co. in shades of blue and green had me at hello. It only takes a few years for the little baby to turn into a young lady. Instead of designing a juvenile room for a girl (which she will probably out-grown in a few years), I say curate a room with longevity in mind. Take the pattern and color mixes in the inspiration shot, I don't think any teenage Princess will say no to this hip, sophisticated bedroom. Aside from the pattern plays, the scalloped headboard with contrasting pipping + nailhead trim is a crucial piece in this girl's room by Sarah Richardson. 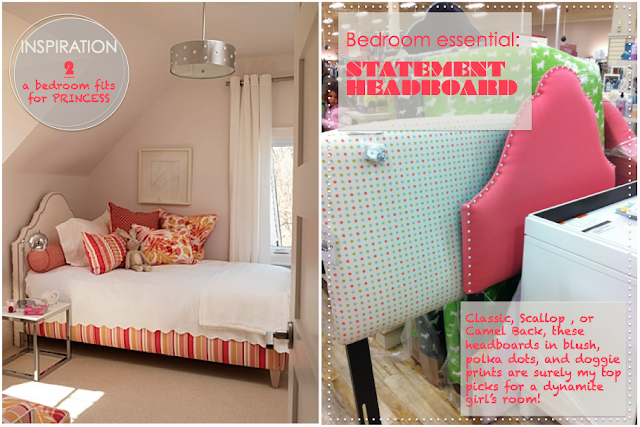 If you want to jump start your girl's room project with a statement headboard, look at what I've found! No contrasting pipping but it's pretty close to the headboard in our inspiration room. I am of course crazy about that polka dot number ... who wouldn't? Now to accessorize the girl's room, I found this jaw-dropping bench in trendy animal print: perfect to sit at the foot of the bed or in front of a nice window nook. 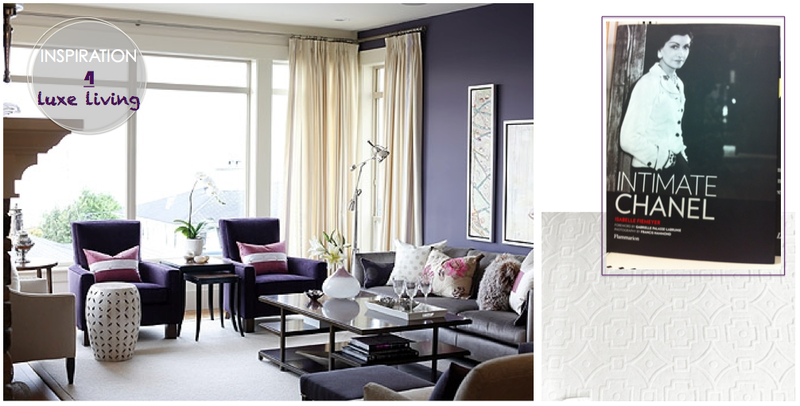 For a hit of pattern on the floor, I have selected this gorgeous rug for color and an extra dose of sophistication. Polka dot shade with crystal ball lamp base is every girl's dream and to wrap up the project, here is yet another fun print by The Penny Paper Co. for HomeSense! Now lets talk about the rooms that I would love to have in my own home. This industrial chic home office with reclaimed, stripped metal lockers, double shots of vintage cool black pendants, and natural wood bookcases is definitely going right into my "Home Office Inspiration" folder. I know sometimes a complete overhaul may not be in the cards (as in my case, Chris wants the dining room to double as home office ... wish me luck! 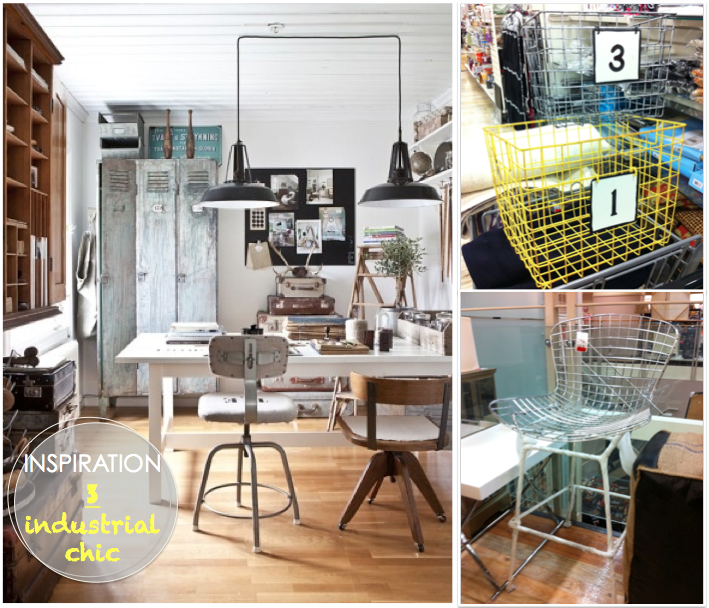 ), perhaps a couple of wired baskets and mid-century modern style stools will help inject that industrial vibe you are after in your space. Here comes a decorator's dream: if I can just go all out and create a home office space in my condo (a.k.a. 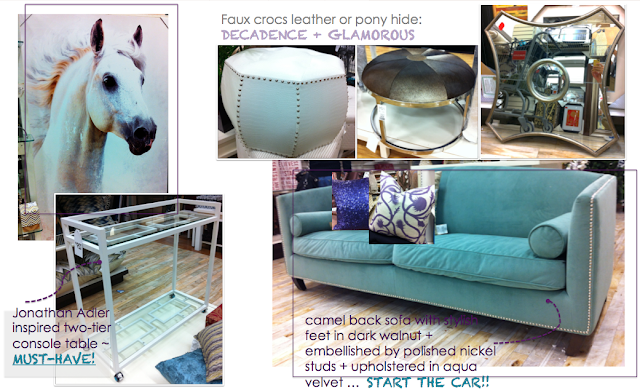 creating extra square footage + budget out of thin air), here are the items I would snap up in a heart beat. Similar to the inspiration room, I would set the tone with this stunning bookcase in natural walnut finish. It provides plenty of open and closed (with baskets) storage and best of all, it comes with an old fashion library ladder! I DIED. I would also love to have the room for a settee for me to lounge and relax after working a few hours in the office. This luxe linen covered side table with brass frame is definitely sitting in the lounge zone. A hot modern lamp, a couple of trendy ikat pillows, and some super chic desktop accessories, my home office is ready for business. With the holiday season quickly approaching, I am also drawn to spaces that are rich, luxe, and ready for an intimate party. This fashion forward plum infused living room designed by Sarah Richardson is a perfect example of how to create an inviting, exquisite, and elegant space. A couple of tricks to add a sense of luxury to your space: fab coffee table book (Intimate Chanel) and gorgeous wool rug with subtle pattern. To add a touch of glamour and get your living room in party mode, here are a few of my picks. To anchor the space, this classic, tailored sofa upholstered in rich aqua velvet with polished nickel nailhead trim and espresso feet is an absolute must have. For extra seating or to double as coffee table, why not pick up a white faux crocs leather ottoman? Deviating from my usual comfort zone (well ... white if you wonder), I think I will actually go for this round faux pony hide ottoman with polished chrome base. Super glam and oh so Hollywood. Every party needs a bar and this Jonathan Adler inspired two-tier console table is sensational. Party is all about interesting conversation with friends, so why not add a majestic piece of art or fantastic mirror to the space as conversation starters? So what do you think? I think this is pretty fun and it is such a perfect way to illustrate how you can curate your own home with stylish and affordable pieces from HomeSense. Love to hear what you think and happy holiday shopping everyone! Thanks Lisa! Yes it's a lot of work but so rewarding! I hope you all love the new look as well and I will try my best to keep this up month after month! Got to love HomeSense! Great blog... I'm new to your site and am loving it. Question - was that white chair with the orange floral print at Homesense? If yes, which one? good luck on that! I love that rug too .... too bad I have no room for yet another one at my own house! Haven't seen the silver and glass bird-footed side table in store yet... will keep that in mind! Can we please talk about that AMAZING orange nursery? It's so refreshing to see a baby's room decorated in something outside of the standard pink or blue colour palette! I know right? so chic and totally hip well into the teenage year! Who wouldn't love a nursery like this ... I Love it and I don't even have a bb! I'm just going to echo what Lisa said- Aces on the post my friend!!! Love how you took the inspiration and actually found all the goodies to make it happen! awww .... Thanks C! 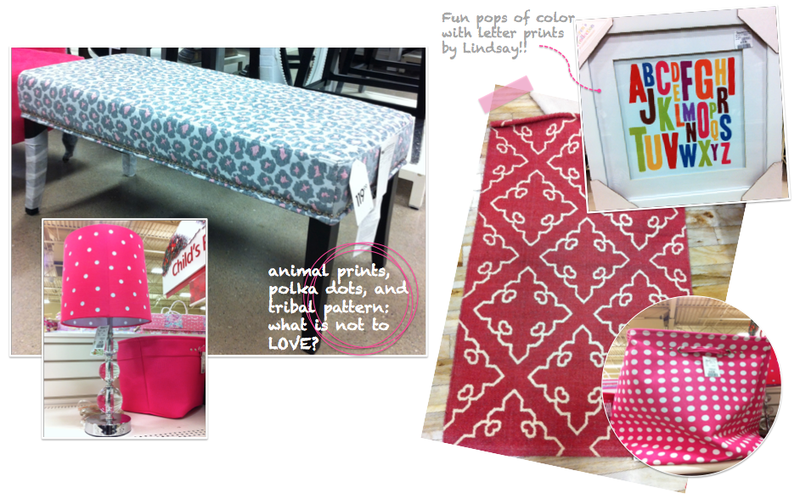 Glad you like my new take on HomeSense Special too!